This particular parking structure is for 2,300 vehicles. Silica-fume concrete was a bid alternate to a traffic membrane. The silica-fume concrete alternative was less than half of the cost of the traffic membrane. The structure was post-tensioned, cast-in-place concrete. 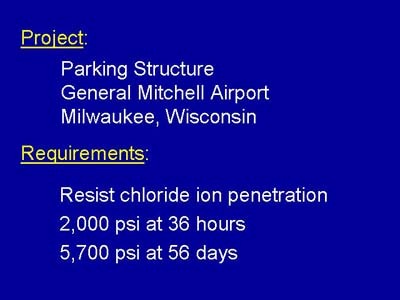 The requirement for the 36 hour strength was to allow for post tensioning. For additional information on this project, please see: Rocole, Larry, "Silica-Fume Concrete Proves to be an Economical Alternative," Concrete Construction, Vol. 38, No. 6, pp. 441-442.